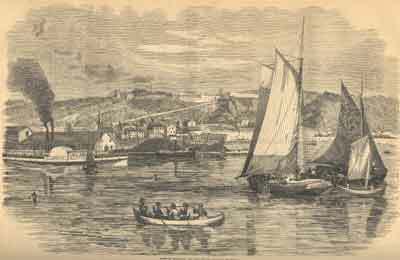 Woodcut engraving of the town and harbour of Mackinac at the entrance to Lake Michigan. The artist has included a paddlewheel steamboat, a propeller, a couple of schooners, smaller saling craft and a canoe. Piles of cordwood can be seen on a wharf in the middle distance. Fort Mackinac can be seen on the heights.